Why opt for Decorating Wine Glasses? A wine glass is not just a glass comprised of a bowl, stem, and foot. It far more than that, it is a perception. There is a particular reason behind the shape and style of holding a wine glass. The long stem of the glass helps in preventing the temperature of the wine so that the body heat of the holder does not affect it. It is still controversial issue that the shape of the glass has any relation with the taste of the wine in it. If you want to taste all the nuanced flavors of wine, then a perfect wine glass is a must. Wine has to be filled in a glass to a certain level it should not be less and not more. The wine should be till the broadest point of the glass and there should be ample space for swirling the drink. Why Is a Wine Glass Important? 1. It releases aroma. Having wine is all about enjoying the aromas. The swirling of wine releases the aroma, which adds flavor to the wine. 2. It collects aroma. Yeah, surprisingly the wine glasses are aroma collectors. The empty space left between the wine and sipping area is called aroma collector. It’s the bowl of the wine glass that offers this benefit to the wine. 3. The lips of the glass are supposed to be thin for a better drinking experience. The lips of the glass should not come in between the sipper and wine. It has to be sipped flawlessly. When a glass is so important for the drink to be poured in, then decorating it for varied occasions like weddings, etc. is also equally required. Below are some interesting and easy ways to decorate your wine glasses. For this, you need a bowl of chalkboard paint. Then simply dip the foot of the glass in the paint and then let it dry. Once the wine starts flowing, no one remembers whose glass was lying where. With this technic, the holder could write their name on the painted surface. You could select black or gold, silver colors for painting the base. You can use glitter paints over the bowl. Any color could be used based on the theme of the wedding or party. You can even use glass on the lower portion of the bowl till the line that contains wine. Then sprinkle glitter on that glued area. It fabulously decorates your glass with style. With glitters, varied experiments could be done over the glass. It could be personalized by writing an alphabet over the glass with the glue and then sprinkle glitter on it. It gives an elegant and classy look to the glass. 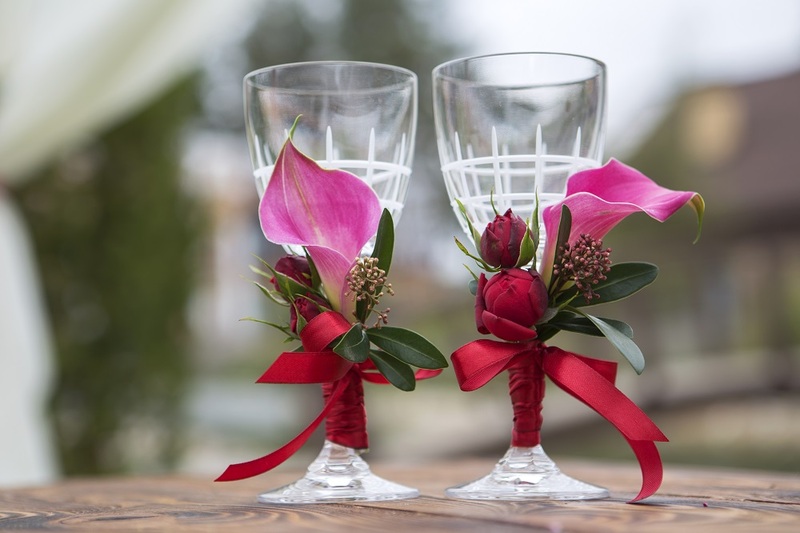 Bride and groom themes are also a nice style of decorating the wine glasses. You will need pearl lace, stick it on the glass stem with glass glue. On the bowl apply, white thin lace with the glue. Then stick few flowers and pearl beads on the laced area. Similarly, you could use black or blue color for groom theme. Glass painting is a good idea to decorate the wine glass based on the color theme of the party. It could be polka dot, over the stem or bowl in different colors and patterns. Floral colors and design, or golden color could also be applied for decorating the glass. Thus, decorating wine glasses is a great option.